1. to check out your links and make sure they are "kosher" and not "messianic" in any way shape or form. 2. to delete all comments that are proselytizing in nature to Jews. 3. to not blindly accept "Zionism" as a common ground with those whose ultimate goal is to convert us and bring us to idol worship. 4. to actively speak out against evangelizing of Jews by any religion and to try to mikadesh your site as a tool for kiruv (bringing Jews back to the faith). If you agree to these terms, please email me at judahhakohain[at]yahoo.com and I will gladly send you a copy. Welcome to Tomer Devorah! Please visit this great site of emmes and chizuk by clicking on the palm tree or visiting the side links. From the LA Times: Delicate decision: To circumcise or not? "Freedman faced the decision in his own home. He's Jewish and his wife is not. She wasn't for circumcision. In the end, they agreed to circumcise their son, and he performed the procedure. "I didn't make any excuses that this was to avoid a UTI, or for medical reasons. 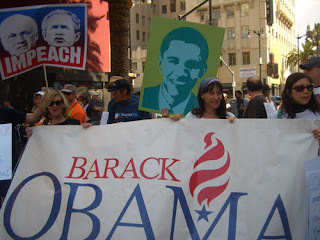 My rationale was this: As a Jewish male in a long line of tradition, I didn't want to be the link in a chain that broke." ed. G-d forbid he should be the broken link of tradition by not circumcising his non-Jewish son born of an intermarriage. Way to go! 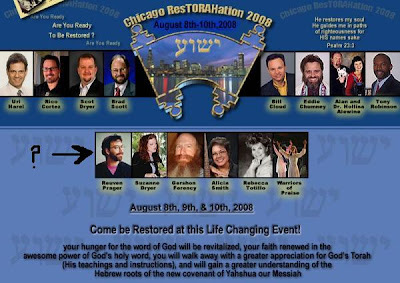 Take a gander below at the "messianic" Chicago "ResTORAHation" 2008 convention. You will notice that "Beged Ivri" founder Reuven Prager is slated to appear. Why exactly is Mr. Prager cavorting with so-called messianic Jews and why in G-d's name is Arutz Sheva promoting him on their Tuesday Night Live program? He is also listed as a link on the Tree of Life messianic Assembly. His fault? No. But where is the repudiation of apostate Judaism and evangelical groups who support them? Perhaps they're the "Biblical lifestyle's" bread and butter? That's no excuse. What's more "Biblical" than uprooting idol worship and preventing other Jews from falling into it's sticky, fetid trap? Isn't idol worship one of the reasons we were expelled by G-d from Eretz Yisrael (ironically making us give up the biblical lifestyle for 2000 years)? There can be no excuse for targeting these groups for profit if it endangers Jewish Neshamot. It's not as bad that he's listed on all these messianic sites as it is what's missing from his own: a statement denouncing these soul thieves and their underhanded tactics. Achdut and Kol Yisrael Arevim Zeh l'Zeh is what will bring the Redemption, not biblical garb. "Would you please comment on why you are appearing at a messianic convention in Chicago in August? 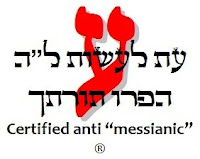 Do you endorse "messianic" judaism? 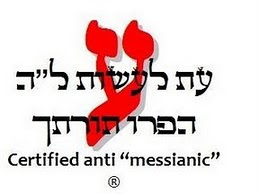 Are you yourself "messianic" in that you consider the Christian god (aka Jesus) the Jewish Messiah?" Interesting video from Arutz Sheva regarding the wearing of tacheilis (blue thread). Watch it HERE. In addition to my briefcase I came with a bag, containing the first Beged Ivri tunic I had ever produced - from Tallith material - wool with the horizontal black stripe, dingle balls along the front bottom, tzitzith with Radziner Techelet and the finest black satin gartel (sash). It was the most stunning Beged I had ever made. Rav Sheinberg is the 'Tzitzith Rebbe', and he wears layers upon layers of Tzitzith. As I packed up to leave - I figured - go for it - what do I have to lose? I walked up to the Rebbe and held out the corner of the tunic I was wearing, with the Tzitzith and Techelet, and he immediately grasped it from my hand and held onto it. I took the garment I had created with him in mind, and slid it out of the bag and held it up and said "I want to make a trade with you; I want to trade you this Beged for all the tzitzith you are wearing." His son, who also serves as his Gabbai (assistant), came rushing over and said "Put that away before my mother sees it!" (The rebbe wears so many tzitzith that the last thing his wife or doctor want is for him to take on additonal tzitzith.) I noticed though that the rebbe had come alive. The rebbe responded "What? You want to trade that one Beged for all these Tzitzith?" and I replied "Yes, your doctor and your wife will love it!" By this time his son was a full participant in the discussion. He said "But abba (dad) it has sleeves - you won't wear it!" I turned to the rebbe and seeing in his eyes that he wanted it said, "so don't wear it - hang it on the wall and look at it as you walk by." His son came back with "but eema (mom) will freak out" and at that point I turned to him and said, "don't argue with your father" (lovingly and definitively.) Now I turned to the rebbe who was weighing my offer, and I saw in his eyes that he was considering trading one, two, maybe even three of the tzitzith he was wearing, but all of them? He said to me, "Are you kidding?" Now of course I wasn't really looking to trade one garment for 60, I was looking to trade concepts, and I said "those are tzitzith for Galut (exile) - this is tzitzith for Geulah (Redemption), and asking if he would like to have it, he nodded to his son to accept it. I won. The rebbe got his garment. First of all, all kavod due a Gadol Ha-Dor, Rav Sheinberg is not a "rebbe" but a Rav. He is Rosh Yeshiva of Torah Ore in Yerushalayim and a prominent posek. To quote wikipedia: "A rebbe is distinct from a 'rav' or 'rov' (a word usually translated as rabbi, who is a leader of an Orthodox Jewish community, either hasidic or non-hasidic) in that a significant function of a rav is to answer questions of halacha (Jewish law). It is not uncommon for a hasidic Jew to have a rebbe as a spiritual guide and to go to a (another) rav for a ruling on an issue of religious law. Chasidim use the term to denote someone that they perceive not only as the religious leader of their congregation, but as their spiritual adviser and mentor. A rebbe is someone whose views and advice are accepted not only on issues of religious dogma and practice, but in all arenas of life, including political and social issues." Me: "Can I wear tacheilis?" Rav Scheinberg: "Don't do it." Me: "Is it mutar to wear tacheilis?" So I have been tacheilis free since (not that I wore it much to begin with). Let's open up some debate and dialogue. I would love to hear comments and opinions on this subject. Feel free to chime in! Thanks to Nava at Dreaming of Moshiach for the link. Jew Hatred alive and well in Galus. Oriah Ohana, a 25-year-old Israeli rabbi from Kfar Chabad, was attacked by a group of Arab men in Brooklyn, New York City, Tuesday evening. An 18-year-old Arab man grabbed the yarmulka (kippa) off Rabbi Ohana’s head at the 4th Avenue and 9th Street train station in the Park Slope section of Brooklyn, while his friends kicked and punched the victim and screamed "Allahu Akbar" [Arabic: Allah is Great]. Rabbi Ohana chased the man who grabbed the yarmulka. The attacker ran out of the subway station and was hit by a passing car. The attacker’s friends then beat the rabbi, claiming he was the cause of their friend’s misfortune. They escaped before police arrived – abandoning their friend, whose broken legs precluded his escape. Clearly high on crack, the US Ambassador to Israel wants Jews to move out of Jerusalem. US Ambassador to Israel Richard Jones suggested during a tour of overcrowded Jewish neighborhoods in Jerusalem on Monday that many Jews will just have to move out of the capital rather than expand into parts of the city claimed by the Palestinians. Jones told said in an interview with The Jerusalem Post that Washington is growing increasingly displeased with Jewish housing projects on the eastern side of Jerusalem, which are certain to hinder efforts to conclude a peace deal along the lines of US President George W. Bush's vision for the region. The American envoy said he is well aware of the lack of Jewish housing in Jerusalem, but in a remark betraying a lack of understanding regarding Jewish historical and spiritual connection to the city Jones concluded that "sometimes people do have to move to a different location. They cannot always stay close to their families." He insisted that more important than the Jews' restoration to their biblical capital and heartland is Israel's implementation of commitments made as part of the US-driven Road Map peace process, even if unreciprocated by the Palestinians. Jones ended the interview by all but justifying the Palestinian Authority's ongoing failure to meet its primary obligations to curb anti-Israel violence and incitement by stating that "it is not easy for either side to move ahead when they see the provocative behavior of the other side." Not a great comparison, I know. After all, we Jews are the indigenous population. 10. Turns out Barak Obama's actual middle name is Herschel. 9. Natural gas discovered in Monsey, NY, dropping prices to ten cents a gallon. Large, ugly wood-paneled station wagons suddenly back in fashion. 8. Chabadniks and Satmars seen playing golf together. 7. You could hear a pin drop in my shul during davening. 6. 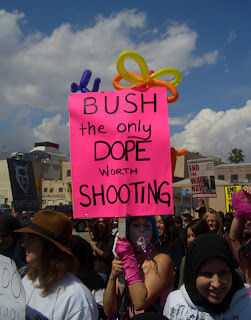 Bush announces his "No Yid Left Behind" program: Free Yeshiva education for everyone. 5. The New York Times runs thirty years worth of corrections for their Israel coverage. 4. Muslims in Hevron suddenly realize that they aren't related to Sarah, Yitzchak, Rivka, Yaakov and Leah and quickly abandon Maarat HaMachpela with their sincerest apologies. 3. Omri Sharon has a vision of the Rebbe while on laundy duty in prison. 2. Turns out the Dead Sea Scrolls was actually comedic material that didn't make the final draft of an ancient Purim shpiel. 1. The sanctity of Jerusalem and the Temple Mount is universally accepted... by the Knesset. Extry! Extry! United states is slanted! 'cause all the nuts roll to LA. Unfortunately the bottom picture is no less extremist then the top two. Get ready for a bumpy ride, folks. You're about to be kicked in the crotch by "change." And let me ask... why wasn't the person in the first picture arrested for incitement to violence? She is advocating the murder of the President of the United States! Is this the agenda of the radical left? If a Republican were to carry a sign saying the same thing about Hillary or Obama they would be labeled extremists and hate mongers. Photos are from Ringo's Pictures. Please click above to visit his site. Rav stabbed near Damascus Gate. IsraelNN.com) Rabbi Yechezkel Greenwald, father of four, is in Hadassah Ein Karem Hospital after being stabbed in the neck by an Arab terrorist near the Damascus Gate in Jerusalem’s Old City on Tuesday morning. The 49-year-old Beit El resident is a teacher at the Ateret Cohanim Yeshiva in the Muslim Quarter of Jerusalem. A student who was accompanying the rabbi reportedly fought off the terrorist, preventing the rabbi from being more seriously hurt. Rabbi Greenwald was treated by Hatzalah-Ichud medics on the scene, and was evacuated to the hospital by a Magen David Adom ambulance. His condition improved as the hours passed, and by early afternoon he was reported to be in light condition. The Greenwald family has asked that people pray for Rabbi Yechezkel ben [son of] Zahava. Seems like it's time for Jews world wide to prepare for attacks. We need to be comfortable enough to defend ourselves and fight back. If this can happen in OUR city, it can happen anywhere. Archaeologists from the Institute of Prehistory and Early History of the University of Vienna have found an amulet inscribed with a Jewish prayer in a Roman child’s grave dating back to the 3rd century CE at a burial ground in the Austrian town of Halbturn. 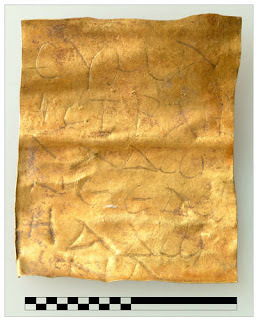 The 2.2-centimeter-long gold scroll represents the earliest sign of Jewish inhabitants in present-day Austria. This amulet shows that people of Jewish faith lived in what is today Austria since the Roman Empire. Up to now, the earliest evidence of a Jewish presence within the borders of Austria has been letters from the 9th century CE. In the areas of the Roman province of Pannonia that are now part of Hungary, Croatia and Serbia, gravestones and small finds attest to Jewish inhabitants even in antiquity. Jews have been settling in all parts of the ancient world at the latest since the 3rd century BCE. Particularly following the second Jewish Revolt against the Roman Empire, the victorious Romans sold large numbers of Jews as slaves to all corners of the empire. This, coupled with voluntary migration, is how Jews also might have come to present-day Austria. The one or two year old child, which presumably wore the silver amulet capsule around its neck, was buried in one of around 300 graves in a Roman cemetery which dates back to the 2nd to 5th century CE and is situated next to a Roman estate ("villa rustica"). This estate was an agricultural enterprise that provided food for the surrounding Roman towns (Carnuntum, Györ, Sopron). The gravesite, discovered in 1986 in the region of Seewinkel, around 20 kilometres from Carnuntum, was completely excavated between 1988 and 2002 by a team led by Falko Daim, who is now General Director of the Roman-German Central Museum of Mainz, with the financial backing of the Austrian Science Fund FWF and the Austrian state of Burgenland. All in all, more than 10,000 individual finds were assessed, most notably pieces of glass, shards of ceramic and metal finds. The gold amulet, whose inscription was incomprehensible at first, was only discovered in 2006 by Nives Doneus from the Institute for Prehistory and Early History of the University of Vienna. Hear, O Israel! The Lord is our God, the Lord is one. 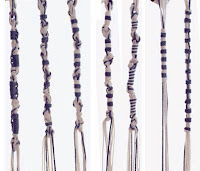 Greek is common with amulet inscriptions, although Latin and Hebrew and amulet inscriptions are known. In this case, the scribe's hand is definitely familiar with Greek. However, the inscription is Greek in appearance only, for the text itself is nothing other than a Greek transcription of the common Jewish prayer from the Old Testament (Deuteronomy, 6:4): "Hear, O Israel! The Lord is our God, the Lord is one." Other non-Jewish amulets have been found in Carnuntum. One gold- and three silver-plated amulets with magical texts were found in a stone sarcophagus unearthed west of the camp of the Roman legion, including one beseeching Artemis to intervene against the migraine demon, Antaura. Amulets have also been found in Vindobona and the Hungarian part of Pannonia. What is different about the Halbturn gold amulet is its Jewish inscription. It uses the confession to the center of Jewish faith and not magic formulae. (IsraelNN.com) The Israel Antiquities Authority announces the first time in the history of the archaeological research of Jerusalem that building remains from the First Temple period have been exposed so close to the Temple Mount – on the eastern slopes of the Upper City. A rich layer of finds from the latter part of the First Temple period (8th-6th centuries B.C.E.) has been discovered in archaeological rescue excavations near the Western Wall plaza. The dig is being carried out in the northwestern part of the Western Wall plaza, near the staircase leading up towards the Jaffa Gate. The Israel Antiquties Authority has been conducting the excavations for the past two years under the direction of archaeologists Shlomit Wexler-Bdoulah and Alexander Onn, in cooperation with the Western Wall Heritage Foundation. The remains of a magnificent colonnaded street [i.e., lined by columns] from the 2nd century C.E. were uncovered; the street appears on the mosaic Madaba map, and is referred to by the name Eastern Cardo. The level of the Eastern Cardo is paved with large heavy limestone pavers that were set directly atop the layer that dates to the end of the First Temple period. This Roman road thus “seals” beneath it the finds from the First Temple period, protecting them from being plundered in later periods. The walls of the buildings found in the dig are preserved to a height of more than two meters. Another impressive artifact found in the salvage excavations is a personal Hebrew seal made of a semi-precious stone that was apparently inlaid in a ring. The seal is elliptical and measures approximately 1 by 1.4 centimeters. The seal's surface is divided into three strips separated by a double line: in the upper strip is a chain decoration comprising four pomegranates, and in the two bottom strips is the name of the owner of the seal, engraved in ancient Hebrew script. It reads: "[Belonging] to Netanyahu ben [son of] Yaush." Though each of the two names are not unfamiliar, no one with that name is known to scholars of the period. A vast amount of pottery vessels was also discovered, among them three jar handles that bear similar stamped impressions. An inscription written in ancient Hebrew script is preserved on one these impressions, reading "Belonging] to the King of Hevron." S'lach lanu Avinu ki chatanu. This post is part of my teshuvah process. Recently there has been a ton of machlokes in the shul in which I daven. Last Shabbos the lashon hara was flying from all sides and I found myself getting sucked in. I cannot imagine the damage done to my neshama (chv'sh). I fully understand how awful lashon hara can be and how its effects spread like a virus. Information was unclear, passions got inflamed and the flood gates of accusations and anger spewed forth. Again, I was caught up in it and I should have just walked away. I have made amends, but the words are still out there hanging like a toxic cloud. The time of Redemption is drawing closer. More tsuris, more machlokes, more infighting is infecting us. We need achdus and forgiveness and to up our learning. These will help bring Mashiach. Don't be caught unprepared. People who kill and maim innocents are not martyrs. They are cowards. The so called Palestinians weep over the victims of Baruch Goldstein but dance in the street when Jews are slain. Interesting: a Jew kills - both Arabs and Jews are sad. An Arab kills - Jews are sad and Arabs rejoice. JERUSALEM — A gunman entered the library of a rabbinical seminary and opened fire on a crowded nighttime study session Thursday, killing eight people and wounding nine before he was slain, police and rescue workers said. It was the first major militant attack in Jerusalem in more than four years. Earlier reports said there were two gunmen and quoted a death toll of at least 10. Hamas militants in the Gaza Strip praised the operation in a statement, and thousands of Palestinians took to the streets of Gaza to celebrate. May G-d avenge their blood. End all negotiations now! (IsraelNN.com) "The day will come when we will banish you from this building and from the national home of the Jewish People," MK Eitam told Arab MKs during a Knesset session on Wednesday morning. Arab MK Jamal Zakhalka was thrown out of the plenum when he yelled repeatedly at Eitam in response. Eitam, an IDF Brig.-Gen. in the reserves and currently a Knesset Member of the National Union party, was referring to an anti-Israel protest held in the Israeli-Arab city of Umm El-Fahm last night, at which Israeli-Arab citizens burned an Israeli flag, carried flags of Syria and the Palestinian Authority, and compared IDF soldiers compared to Nazis. Arab MKs who were present incited the crowd against Israel. "We must expel you," Eitam said in the Knesset, directing his remarks specifically to Arab MKs Zakhalka and Taleb A-Sana, "as well as all those who took part in the traitorous and out-of-control event last night. We must expel you to Gaza." Zakhalka started yelling uncontrollably, "You are a zero of zeroes! A racist! Shut up! Who do you think you are?! 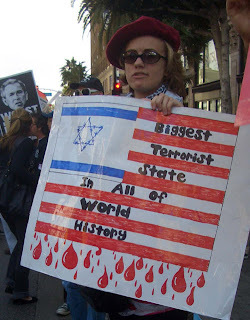 You killed babies in Gaza!" Eitam continued, "You are self-declared enemies of the State of Israel." Zakhalka continued to shout, and was then ordered out of the plenum by the acting Speaker, MK Otniel Schneller. "Just as you promised the shahids [holy martyrs, killed while trying to murder Jews - ed.] of Gaza that you intend to complete their work," Eitam said, "I tell you that the day will come when we will banish you from this building and from the national home of the Jewish People. You well deserve it... No democracy can tolerate the type of incitement that was heard last night in Umm El-Fahm." OU's stance is as treif as you can get. (IsraelNN.com) The Jewish Council for Public Affairs (JCPA) endorsed last week, for the first time, a two-state solution to the Middle East conflict - and member-organization Orthodox Union (OU) abstained. A statement of explanation by the OU is due out in a number of hours. The abstention by the Orthodox Union, one of the 14 member national organizations, aroused great opposition in Israel's national-religious camp. Representatives of this camp who asked why the OU did not actively oppose the creation of a Palestinian state in the Land of Israel were informed by the OU that it had "informed the JCPA of our intention to file a formal, written dissent from the portions of the resolution with which the OU disagrees." Statement to be Ready "in a Few Hours"
On Wednesday, a top OU official in New York informed Arutz-7 that a statement of clarification regarding the OU's position on a Palestinian state would be ready within a number of hours. The OU also took pains to explain publicly that it had taken an active role in the JCPA's debate on the resolution, attempting to remove two of its more controversial calls: a call for support of the “two-state solution,” and the call for American Jewish support for Israeli negotiations over the re-division of Jerusalem. These two calls are included in the resolution, however. The OU also said it succeeded in inserting two statements into the final resplution. The first statement was this: “Israel’s repeated offers to establish ‘two democratic states living side by side in peace and security’ have been met, time after time, by violence, incitement and terror.” In addition, a call for the American Jewish community to support Israel’s recognition by the Palestinian Authority as a “Jewish state” was included. Finally, the OU explained, it succeeded in defeating a proposed amendment to the effect that the expansion of Israeli settlements is an “impediment to peace.” The final resolution, however, expresses approval of Israel's commitment "[not to] allow any new settlements or land acquisitions that are not in accord with the provisions of the Roadmap;" the OU did not state that it objected to this clause. Insanity strikes again. How long can Israel tolerate enemies in its midst, let alone in its government? (IsraelNN.com) Several thousand Arabs led by Arab nationalist Knesset members participated in a procession through the Israeli city of Umm el-Fahm near Megiddo Tuesday evening. The demonstration was held in protest of Israeli military operations in Gaza and involved incidents of rock throwing at Israeli cars. The crowd chanted "Israel, the mother of terror" and held a sign that read "Stop the Zionazi" in English. Additional slogans were "Rest, O martyr, we will complete the task," "Warm blessings to the rock children," as well as the standard "With blood and spirit, we will redeem Palestine." The participants held Syrian and PLO flags. Some of them covered their faces with keffiyehs, or traditional headdresses, in the manner of terrorist thugs. Arab Knesset members from several factions spoke to the crowd and reviled Israel for what they called "the massacre in Gaza." The speakers also justified the rocket fire on Israel and insisted it was a reaction to Israeli actions. Umm el-Fahm Mayor Sheikh Abd-el Rachman demanded that Mahmoud Abbas, chairman of the PA , and Ismail Haniyeh, the Hamas leader in Gaza, stop fighting and join hands. He said that "resistance" (a code word for armed attacks) should continue alongside peace talks. Towards the end of the rally, Arab youths threw rocks at passing Israeli vehicles on Highway 65. Police arrested two suspects. No one was hurt in the rock-throwing incidents and no damage was caused..
An Arab source told Haaretz newspaper that the organizers had expected more people to take part in procession. "I would have expected twice as many people," he said. "Perhaps we have lost the momentum." Arab MKs enjoy full rights as legislators yet regularly denounce Israel and side with its enemies. A former Knesset Member, Azni Bishara, fled from Israel after the intelligence services discovered he had held apparently treasonous contacts with Hizbullah during the Second Lebanon War. MK Ahmed Tibi is Deputy Speaker of the Knesset and has a large poster of PLO founder and terror master Yasser Arafat on the wall of his knesset office. Kind of says it all. GAZA CITY, Gaza Strip — Israeli troops turned heavy firepower on rocket squads bombarding southern Israel Saturday, killing 54 Palestinians in the deadliest day in Gaza since the current round of fighting erupted in 2000. Two Israeli soldiers were killed and seven were wounded in the clashes, the military said. The violence took a heavy toll on Gaza civilians. Moderate Palestinian leaders called the killings a "genocide" and threatened to call off peace talks. Here's MY response Mahmoud: Gey cocken afen yam.